When I wrote the first edition of this book, the RS-232 serial port was the workhorse of PC interfaces. Modems and scores of other peripherals connected to PCs via the serial ports that were present on every machine. Read more. Jans book is about as complete a reference as youll find on serial communications using RS-232 and RS-485. The code could save you some time; the reference material surely will. Jack Ganssle, The Embedded Muse. Complete review. The examples I coded were appropriate and they worked. If you've ever looked for serial port examples online, you have probably beome very frustrated scanning through examples that were excessively complex, didn't apply anymore, or didn't really do much. The examples here won't frustrate you. - Dan Mabbutt, About.com: Visual Basic. The writing is clear and understandable, with circuit and timing diagrams augmenting the written explanations. And it's worth pointing out that it's not just the how it's the why that's explained as well. In particular the emphasis of the book is on doing something useful with these devices, so there's a lot of coverage of serial communications in the form of RS-232 and RS-485. TechBookReport. Complete review. Whether your interest is hardware or software and whether you work with PCs, embedded systems, or both, youll find useful guidance in this book. EDN. (From a review of both Serial and Parallel Port Complete.) Despite the books' detailed technical content, their style is clear. Although they contain enough material to satisfy most hardware and software engineers who develop products containing communication ports, the books should also prove useful to serious hobbyists. Nevertheless, despite their broad appeal, Parallel Port Complete and Serial Port Complete are far from watered-down pablum. - Dan Strassberg, EDN. You would spend a lot of time looking for all the information that the book collects in one place. If you plan to use a serial port in any sort of application, buy this book. - Jon Titus, Test & Measurement World. This book covers everything you'd ever want to know about serial ports and network projects. And it's not all theory. This is a very practical book, full of detailed examples - including Stamps and Visual Basic. Both books [Programming and Customizing the Basic Stamp Computer is the other] are professionally published and put together exceptionally well. Each contains detailed code listings, clear and concise diagrams, tables, and schematics...these books are "must-haves" for serious experimenters. - Jon Williams, Nuts & Volts. 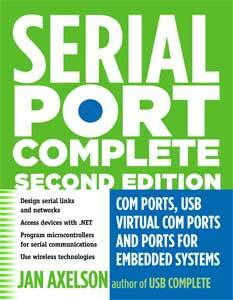 The first edition of Serial Port Complete (ISBN 0965081923) is out of print. Disc contents. A zip file containing everything that's on the disc included with the first edition.